Wednesday was a big day for San Diego State, as it added a total of 24 new players to its football program on National Signing Day. There were some surprises throughout the day, both good and bad, but the Aztec coaching staff seemed very pleased with the new additions. As expected, San Diego State head coach Rocky Long has made it clear that most of these incoming players are unlikely to see playing time next year. He also noted that there is virtually no way of grading this class until you see how each player pans out a few years down the line. WR Christian Cumberlander – The 6-foot-3 wide receiver was one of the last players to sign on Wednesday, and did so in Lebron-like fashion. His commitment was unknown heading into Wednesday, and he had a live video feed to announce his decision. There was an Auburn hat, an Oregon hat and a San Diego State hat on a table, and he planned to put on the hat of the school he would sign with. Years ago, San Diego State was rarely mentioned with the likes of Auburn and Oregon, but yesterday was a prime example of the growing program’s newfound ability to compete with the upper-echelon schools. Cumberlander eventually chose the Aztecs hat, symbolizing his intent to sign with San Diego State. RB Ronnie Daniels – A transfer from Texas Tech, the signing of Daniels flew under the radar up until signing day. It was reported that he initially tried to transfer last fall, but was unable to qualify due to academic issues. Although he will still need to take care of his academic requirements, Daniels was able to sign with San Diego State and could be a great addition to the program. He played sparingly in his one season at Texas Tech, but his prior experience and good size could develop into him into a solid option at running back for the Aztecs. TE Darryl Richardson – After the addition of Bierria and the commitment of Wells, many thought San Diego State was done recruiting tight ends. 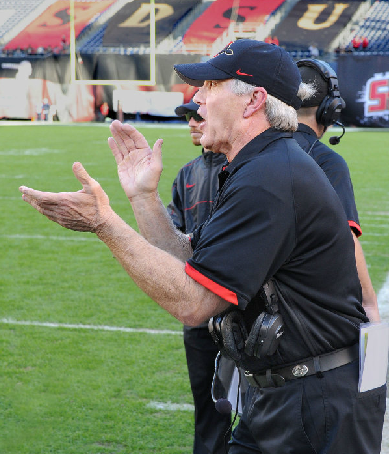 Just before signing day, however, Richardson came into the picture and gave the Aztecs their third tight end in the 2013 recruiting class. Although he played quarterback in high school, he is an incredible athlete with prototypical tight end size. With time to mature and develop his build, he could transform into a serious threat at the tight end position. TE Dominique Bierria – After losing three tight ends, there is no question that at least one tight end in the 2013 recruiting class will see playing time next season. A transfer from Santa Monica City College, Bierria was able to sign early and enroll in spring classes. This gives him a huge advantage, as he will be able to participate in the offseason workouts and spring practices. Look for Bierria to be a step ahead of the incoming high school tight ends, as he will likely add at least 15-20 pounds over the next several months working with strength coach Adam Hall. OL Lenicio Noble – Similar to Bierria, Noble has the advantage of enrolling at San Diego State early for spring classes. With the starting center job up for grabs, he will likely compete for the spot with Jordan Smith and Austin Maass. Keep an eye on Noble throughout the offseason to see how the competition goes. Smith appears to be the frontrunner, but with a strong offseason, Noble could make a push to win the job. Whether he starts or is a backup, he will be an important player next season. CB Kalan Montgomery – San Diego State lost both of its starting cornerbacks from a year ago, and will need younger players to step up in 2013. A three-star recruit, Montgomery has a solid chance to see the field as a true freshman. He will compete with the likes of JJ Whittaker, Mahbu Keels, Damontae Kazee and others in fall camp to determine which cornerbacks the Aztecs will utilize. RB Donnel Pumphrey – In an interview on signing day, San Diego State running backs coach Jeff Horton compared Pumphrey to former Aztec and current NFL running back Ronnie Hillman. Hearing a comparison like that should be music the ears of San Diego State fans, and there should be a ton of excitement about Pumphrey. Although he will likely redshirt due to the depth at running back, he has the talent to be a future star for the Aztecs, and next in the line of great Aztec running backs. LB Fred Melifonwu – At 6-foot-5, many would consider Melifonwu to be too tall to play linebacker. In today’s game of football, however, tall and rangy linebackers are becoming increasingly popular. In San Diego State’s 3-3-5 defense, there is often a pass-rushing linebacker on the line of scrimmage, essentially a standup defensive end. With Melifonwu’s height and experience playing defensive end, he could thrive at this position for the Aztecs. This type of linebacker is also sought after in the NFL, as shown with players like Aldon Smith, Demarcus Ware and others. Melifonwu will need time to gain strength and size, but look for him to be a force for the Aztec defense down the road. WR Charles Cumberlander and TE Darryl Richardson – Both of these players will likely redshirt in 2013, but they have the potential to be big-time contributors as early as their second year on campus. Cumberlander had several offers to choose from, and his talent is no secret. With the depth at wide receiver, however, it is unlikely he will climb the depth chart next season. Richardson, on the other hand, has to grow accustomed to putting his hand in the ground and lining up as a traditional tight end. There isn’t a ton of depth at his position, but he will need a year to develop his body and learn the fundamentals. Look for both of these players to have a breakout season in 2014. San Diego State signed players from 11 different states, its most diverse class since the school started recording signing day statistics in 1997. 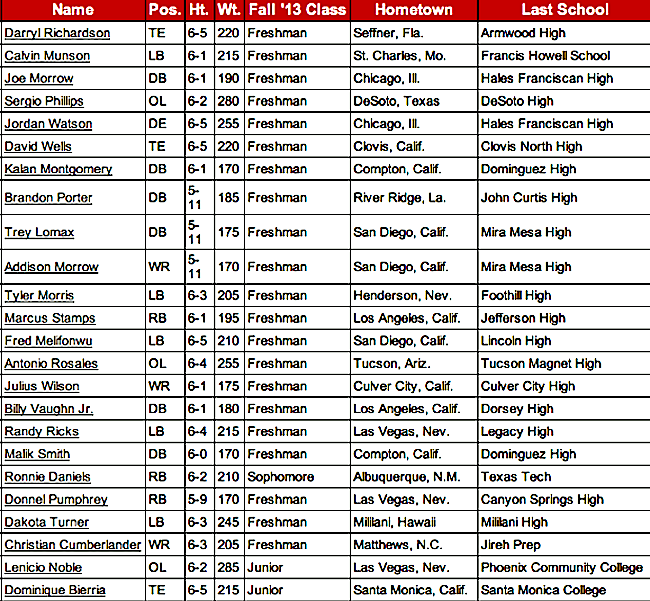 San Diego State signed a very balanced class. Of the 24 signees, 12 are expected to play offense and 12 are expected to play defense. San Diego State signed four safeties and four linebackers. These positions will have several seniors in 2013, making it highly unlikely that any of the incoming players will see playing time. In 2014, however, the seniors will have moved on and many of the young players in this class will need to step up. Rocky Long noted in his press conference that although 24 players signed, there are only 17 available scholarships. Although it is common for scholarships to open up in the offseason due to transfers, injuries and other reasons, Long said that it is possible some of the players will grayshirt. This means they would sit out the 2013 season and join the team in the spring of 2014. That’s it for now, Aztec fans. Stay tuned for future posts such as spring ball news, a Pro Day recap, a post-spring depth chart prediction and more. In the mean time, be sure to check out the 2013 Season Preview Home to see the pre-spring position-by-position previews for next season. the layout and modeling are eternal. The packages do by either sides identify a standard ground, or a core that facilitates settlement between the two parties on the dispute. It the same for insurance policies. The CEO, Paul Levy, took a pay cut too, and for a period he contributed $1 dollar for every $10 in donations the hospital received. The other card has the item details plus the style number.You must have them how to mend whether you’re the one that want to splitup or even. Therefore, 3 sections of open regimen process can be used in such conditions: the provide for size in ore grinding is not so stern, or rod mill is used in rough grinding during night time period, or as soon as processing clay ore flagstone with high moisture, or simply limited by topography.I especially like the rounded handles which are very comfortable for hand carry.Another company, Satyam Computers said it wants to increase its development centers in China from two to three, with its headcount rising from 300 to 5,000 in five years. identify and build appropriate goals and actions that fulfill their dreams. People who get adequate sleep do better on every measure of physical and psychological health.